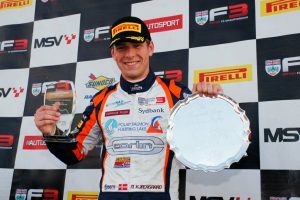 2015 Sunoco Whelen Challenge winner Phil Keen is the new Challenge front-runner following a thrilling and unpredictable weekend of racing at Donington Park last weekend that saw erstwhile leader Linus Lundqvist, from Sweden, endure a troubled BRDC Formula 3 outing. The young Swede headed into the penultimate round with a chance of winning the senior competition’s Rolex 24 At Daytona prize drive thanks to his near-18-point advantage. However, two troubled outings in the Challenge-eligible races resulted in his season’s average reducing by 12.26 marks to 86.07. Keen, meanwhile, approached his final British GT appearance fully aware that only a victory would maintain his hopes of winning both the GT3 Drivers’ title and Sunoco Whelen Challenge. But while a second win of the season ultimately didn’t deliver the championship, victory and pole position helped increase his season’s average by 5.73 points to move the Barwell Lamborghini driver just 0.1 points ahead of Lundqvist. The British F3 Championship leader’s difficult weekend was compounded by domestic title rival Nicolai Kjaergaard who kept himself in both the Formula 3 and Sunoco Whelen Challenge title hunt by claiming two wins and a fastest lap across the two eligible races. The Dane’s new improved total of 79.64 points is thus 6.43 shy of Keen’s total. And so, the Sunoco Whelen Challenge rolls on to Silverstone in three weeks’ time (October 13/14) when Lundqvist and Kjaegaard go head-to-head for the British F3 and senior Sunoco crowns. The former’s task is undoubtedly much simpler: score 175 points from a possible 280. His adversary, on the other hand, requires a near-perfect weekend comprising two pole positions, two fastest laps, a victory and second place while also hoping Lundqvist fails to improve his average. The 265 points earned for those results would also take him above Keen’s current table-topping total. Watching from home will be Keen, who – as a former winner – ordinarily wouldn’t be eligible to contest another Sunoco Challenge. However, as a celebration of the competition’s 10th anniversary, its organisers – Anglo American Oil Company – allowed all former champions a chance to test themselves once again. 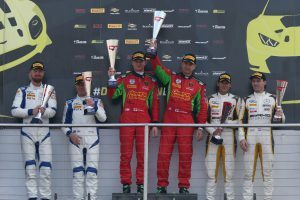 One of them, Jonny Adam, now lies fourth in the standings after wrapping up his third British GT title at Keen’s expense on Sunday. His final average score of 77 points could yet result in two former winners also topping 2019’s standings. Two more British GT3 Pros – Nicki Thiim and Yelmer Buurman – complete the top-six ahead of Radical racer Stuart Moseley and British GT4’s leading Pro, Charlie Fagg, while the top-10 is rounded out by Marco Sorensen and Patrik Matthiesen.